Today, the Riigikogu passed with 54 votes in favour amendments to the Act ensuring better tax behaviour of persons, more efficient tax collection and more flexible payment of tax arrears in instalments. The Act on Amendments to the Taxation Act and Amendments to Other Associated Acts (320 SE), initiated by the Government, makes several amendments aiming at better tax behaviour of persons and more efficient tax collection. On the proposal of the Estonian Chamber of Commerce and Industry, the range of data subject to disclosure are extended. So, the Tax and Customs Board will set out on its website on a quarterly basis the amount of value added tax declared by a person liable to value added tax, and the number of employees in the enterprise. The Act increases the flexibility of the payment of tax arrears in instalments. So far it has been possible to pay tax arrears in instalments only if arrears exist. According to the amendment, in the future, it will be possible to apply for payment of tax arrears in advance if the taxpayer knows that he or she will not be able to meet a fixed-term payment obligation known to him or her. 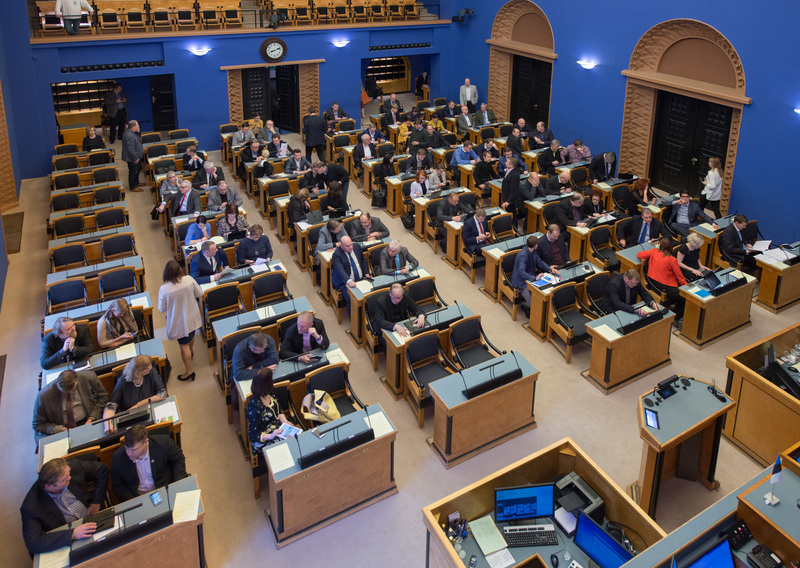 54 members of the Riigikogu voted in favour of the Act, nobody was against and there were no abstentions. The Minister of Justice Urmas Reinsalu introduced the report on the implementation of “The Development Objectives of Criminal Policy until 2018” in 2016 in the Riigikogu. Reinsalu stressed that, in criminal policy, the central aim in controlling crime is directed at reducing recidivism. In his speech, the minister touched upon the main issues of criminal policy in the past year. “In the past year, several issues important in terms of effectiveness of punishment policy received great attention: dangerous criminals, intoxicated drivers and juvenile offenders. Also, support and protection of victims of crime, with an emphasis particularly on victims of violence against women and violence against children,” the minister said. He added that legislative proceedings on draft legislation on these issues were going to be held in the Riigikogu as soon as this year. Reinsalu said that the number of registered crimes had decreased by 11 per cent in 2016. “However, there are several indicators that are nothing to be happy about,” the minister noted. He pointed out that more than 500 corruption crimes had been registered last year. Reinsalu said that a large number of them had been connected with cases where, for a bribe, a vehicle had been marked in the technical passport as being technically in order, although actually it had not been so. The minister noted that at the same time, the number of registered crimes also testified to the very good work of law enforcement authorities. The minister said that 2016 had been remarkable in regards to delinquency of minors. “The number of criminal offences committed by minors registered last year was the lowest over the last decade. Delinquency of minors has fallen to about 1000 which is three times less than ten years ago,” he pointed out. Reinsalu pointed out that proceedings on amendments to the Penal Code were ongoing in the parliament that would enable Estonia to also accede to the convention on combating violence against women and domestic violence which provides for separate specific sanctions for respective criminal offences. The minister said that, compared to the year before last year, less cases of driving while intoxicated had been registered in traffic last year. “However, it is still worrying that every year we have hundreds of people who have been punished repeatedly for driving a vehicle while in a state of intoxication that is subject to criminal punishment,” Reinsalu remarked. Reinsalu said that a package of fundamental rights had entered into force as of September 2016 with a legislative amendment concerning criminal proceedings. “It increased the judicial verification in the case of search and taking into custody, and reduced the terms for holding in custody, because search and taking into custody are acts that significantly infringe the fundamental rights of persons,” he explained. Jaanus Karilaid from the Centre Party Faction, Raivo Aeg from the Pro Patria and Res Publica Union Faction, Liisa Oviir from the Social Democratic Party Faction and Külliki Kübarsepp from the Free Party Faction took the floor during the debate. In their speeches, the speakers focused on various aspects of criminal policy. The Bill on Amendments to the Tax Information Exchange Act and the Taxation Act (322 SE), initiated by the Government, will transpose two amendments to the Administrative Cooperation Directive, and the relevant OECD model for the exchange of information which provides for the communication of the information on an advance ruling of a tax authority only to the country whom the ruling may concern. The amendments will enable the tax authorities of different countries to exchange information on advance rulings and the annual reports of large groups of undertakings. Information exchange between tax authorities increases transparency in taxation and helps combat aggressive tax planning. Tax authorities will have a wider picture of the tax behaviour of undertakings operating across borders, and policy shapers will get a better overview of potential points of conflict between different tax systems. As of 2015, we exchange information automatically in the EU regarding the remunerations, pensions and real estate incomes of people, and the remunerations of members of management boards. Starting from autumn 2017, we will begin to exchange information globally on various financial resources that tax residents of other countries are keeping in our financial institutions. By today, analogous information exchange with the USA has been implemented. A binding advance ruling of a tax authority is a confirmation of taxation of a certain transaction or series of transactions which is binding for the tax authority. Exchange of information on advance rulings will involve no additional obligations for undertakings and it will concern only tax authorities. Information will be exchanged with all EU Member States in regard to binding advance cross-border rulings that have been issued since 2012. Such advance rulings number 46 in total. 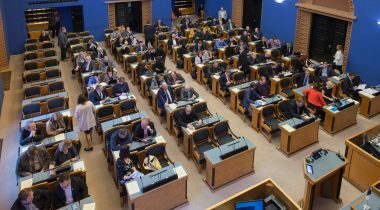 The first reading of the Bill on Amendments to the Social Tax Act (364 SE), initiated by the Estonian Free Party Faction, which had been adjourned due to the end of the working hours of the Riigikogu at Tuesday’s sitting, was continued. The Bill provided for the establishment of an upper limit to the social tax. So far no limit for the social tax has been established in Estonia. It would have been a new phenomenon in Estonian tax policy. The Bill was intended to facilitate high-salaried top-specialists coming to and remaining in Estonia, as well as creation of new high-salary jobs in order to help Estonian economy become smarter and more productive. The obligation to pay social tax would have remained in place in the case of average gross earnings amounting to up to four times the average median payment of three quarters of a year. The Government would have established the rate thereof by its Regulation annually according to statistical data compiled by the Tax and Customs Board. Income from salary above this limit would not have been subject to social tax. As at the second quarter of 2016, according to the Bill, the limit for social tax would have been 3 432 euro. Jürgen Ligi from the Reform Party Faction, Kalvi Kõva from the Social Democratic Party Faction and Andres Ammas from the Free Party Faction took the floor during the debate at Tuesday’s sitting. The lead committee moved to reject the Bill at the first reading. 50 members of the Riigikogu voted in favour of the motion and 8 were against. Thus, the Bill was dropped from the legislative proceedings.